I just finished this new mystery/crime novel, another entry in the growing list of great Scandinavian thrillers. Perhaps a key to their success is that these novels have several nodes of storytelling: a main protagonist, a second protagonist working toward a similar goal but unaware of the first, and a villain (or two) who is working toward the same goal but with a different aim in mind. We get to see the thought processes and psychologies of three or four gripping characters who are slowly converging toward each other. In The Boy in the Suitcase, we have the mother of a kidnapped child, the woman who has found and is protecting him, the kidnapper who's been cheated of payment, and a fourth character whose relationship to the others is murky. 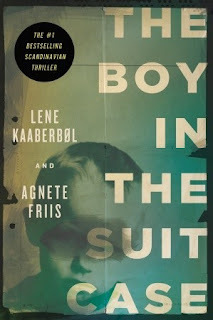 The book was co-written by Lene Kaaberbol and Agnete Friis, which makes it the second co-written Scandinavian thriller I've read in the last few months. Seems like a hard thing to do, co-write a novel, but these authors seem to do just fine.